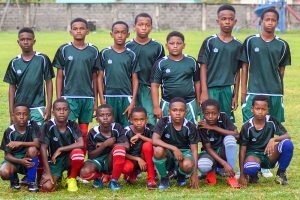 It was sweet revenge for SV United over Owia United last Sunday in the final of the U-13 division of the Hairoun/ National Lotteries Authority North East Football League at the Chili Playing Field. Having suffered a loss to Owia in the preliminary round, SV United got revenge when it mattered most, winning 2-1 on Sunday. Kelvon Charles and Ashal Henry netted for SV United with Kyle Pollard registering Owia United’s lone reply. SV United advanced to the final with a 1-0 win over DESCO. Piece Henry netted the lone item. Owia United’s final berth came via a 3-0 win over Owia United females in the other semi-final. Cody Lavia, Ronniel Thomas and Damary Ashton were the goal scorers. DESCO took the third place, with a comfortable 2-0, blanking of Owia United females in the third place play off, which took place on Saturday. Mitchron John and Simeon Joseph netted for DESCO.